Peter Hain has been a long time supporter of the case for a barrage across the Severn estuary - artist's impression shown left. 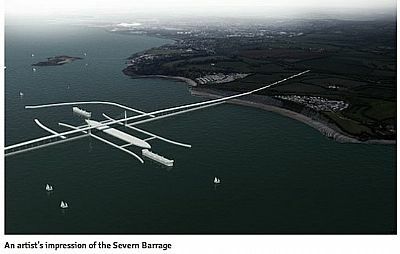 In the mid to late 2000's the Severn Tidal Power Group (STPG) was proposing a scheme in the same part of the Severn estuary as the eventual Hafren one, though with some differences in design. The STPG scheme was rejected by the Government in 2010 after a two-year feasibility study concluded that it would cost £34bn and that there was no strategic case for a publicly funded project. The Secretary of State for Energy at the time was Chris Huhne. The report left the door open for a privately funded scheme, and shortly thereafter the Corlan Hafren consortium was put together. Halcrow was a part of the consortium. The scheme would apparently supply “5 per cent” of our electricity needs by 2022 with a new version of the barrage, funded by more than £30 billion from “Kuwait, Qatar and other sovereign wealth funds”. Corlan Hafren was a private limited company established on 26 August 2010 to facilitate the development of tidal energy in the Severn Estuary. Its directors included Rt Hon Lord Deben John Gummer and Halcrow non-executive chairman Tony Pryor. (Mr Pryor went on to be Chief Executive of Hafren Power Ltd). Corlan Hafren represented the interests of the following associated organisations and individuals: Halcrow Group Ltd, Ove Arup & Partners Ltd, KPMG LLP, Sancroft International Ltd, Marks Barfield Architects LLP and Professor Roger A Falconer FREng. One sixth of the shares in Corlan were owned by Sancroft International Ltd. The six shareholders of Sancroft, an environmental consultancy which also acts as a vehicle for the earnings of Lord Deben, are Deben himself, his wife and their four children, one of whom, Ben Gummer, is a Tory MP. Corlan Hafren put its new proposals to the Department of Energy and Climate Change in 2011. However the consortium was short-lived; it dissolved itself in August 2012 and a new company Hafren Power Ltd was set up. Some of the members were the same, but neither Halcrow nor Lord Deben were on board. The Severn Barrage scheme was then taken forward by this new company Hafren Power Ltd, again a private sector consortium which included major engineering and construction companies. It anticipated the construction of an 18km long barrage across the Severn Estuary stretching from Lavernock Point near Penarth to Brean Down near Weston-super-Mare. In May 2012 Peter Hain had stepped down from the Shadow Cabinet of Ed Miliband so that he could concentrate on promoting and working towards the Severn Barrage scheme. He told Ed Miliband at the time that he would stand in Neath as an MP at the next General Election. He also stated, "If in the future, as I've discussed with Ed, there were to be an opportunity to serve again in Government, obviously that's a matter for him, because the experience I've gained would obviously be relevant." It is apparent from the timeframe that Peter Hain's initial involvement with the Hafren scheme was prior to the creation of Hafren Power, and in the days when the project was being advanced by Corlan Hafren. Since stepping down from the Shadow Cabinet Mr Hain has raised the subject of the Barrage in the House of Commons on numerous occasions. It was raised in Prime Minister's Questions on 6 May 2012, in the Energy Bill debate on 19 December 2012, and in Questions to the Energy Secretary on 11 July 2013. There have also been numerous articles in the local and national press citing the case for the barrage as well as talks and lectures given by Mr Hain. Mr Hain was Chairman of an All-Party Group of MPs that were set up to consider the Severn Barrage scheme. The secretarial support for this Committee was provided by Hafren Power. A business case for the scheme was submitted to the Government and representations made to the Prime Minister’s Office by Peter Hain and the House of Commons Energy and Climate Change Select Committee were asked to consider the Hafren proposal. The Select Committee started hearing written and oral evidence in January 2013 from relevant organisations and individuals, including Peter Hain, and by the beginning of March had received 95 pieces of written evidence and heard from 26 witnesses. Mr Hain's evidence in support of the scheme was presented to the Committee on 10 January, when he appeared alongside Martin Mansfield, the Wales TUC General Secretary, and Andy Richards, the Wales Secretary of UNITE the Union, and President of the Wales TUC. "The evidence presented to us in this inquiry leaves the case for the Hafren Power barrage proposal unproven. Hafren Power has yet to provide robust and independently verified evidence of the economic, environmental and technological viability of the project. The overall socio-economic impact of the scheme remains uncertain. In its current form Hafren Power’s proposal fails to address environmental and commercial concerns in enough detail to allay the concerns of stakeholders and the wider public. Crucially, Hafren Power has failed to demonstrate that the project could offer value for money for the consumer in line with other low-carbon energy sources such as nuclear and off-shore wind." The report concluded with the recommendation that the Government should not support the proposed scheme in its present form and that Hafren Power undertake and make available, further assessments. In September 2013 Peter Hain's website stated that he was convinced there was no future (for Hafren) at present. He referred to the negative approach to the Hafren Barrage from the Department of Energy and Climate Change and the "sheer contempt" that was shown by the DECC officials and Ministers for Hafren's scheme. He complained "Bristol Port’s opposition to the barrage, which in my view is wholly irrational, undoubtedly led to a change in attitude by the Government. It has to be borne in mind that the joint owner of Bristol Port [David Ord] is a leading Tory donor who has attended fundraising events with David Cameron". On 14 January 2014, Wales Online reported that four key players in Hafren had left in the preceding two months. These were its Chairman - Greg Shenkman, its Chief Executive - Tony Pryor, a Non-Executive Director - Lord Rowe-Beddoe, and its Economic Co-ordinator - Andre Karihaloo. However a Company search conducted in February 2014 revealed a further Director's appointment on 16 December 2013, namely a Mr Michael Swanson Davies who resides in Rochester, Kent. In July 2014 a company search revealed that Hafren Power has no cash reserves, no net worth, no assets nor any liabilities. Only one Director of the Company is now listed. The Regional Committee of Hafren was chaired by Dr Elizabeth Haywood (Peter Hain's wife). It was apparently in an unpaid capacity. Mr Hain has repeatedly gone on record as saying neither he nor his wife worked for Hafren. His promotion of Hafren's scheme has however undoubtedly been of considerable pecuniary and other value to them. When he gave evidence to the DECC Committee in January 2013 he advised the Committee that he was working with Hafren Power but had no commercial relationship with it at all. Peter Hain has said he hopes the Severn Barrage scheme can be resurrected under a future Labour Government. At the Welsh Labour Conference in 2014, a resolution supporting the Severn Barrage was passed, Peter Hain making reference to it in a "tweet" at the time. Strangely, in examining reports of the Conference it has not been possible to confirm the passing of such a resolution. In late January 2014 the website of Hafren Power Ltd was no longer operating. 27 January (Twitter) - "Severn Barrage would prevent Somerset levels flooding"
28 January (Twitter) -"Cardiff University modelling on .... barrage demonstrate flood risk reduced in the Somerset Levels"
3 February (House of Commons) - "Is the Secretary of State aware of modelling done by the University of Cardiff that shows that a Severn barrage, operating on ebb flood, would significantly protect the Somerset Levels from flooding and act as a barrier against storm surge, protecting 500 sq km and many properties from flooding? Is that not a reason for pressing ahead with the barrage?" The Hafren Barrage would not have prevented the Somerset Levels from flooding in this particular case. The flooding was caused by the highest, sustained rainfall for 250 years. It was not caused by raised sea levels or storm surges. Hafren was a legendary British princess who was drowned in the River Severn (Welsh: Hafren; Old Welsh: Habren) by her repudiated stepmother Gwendolen. The legend appears in Geoffrey of Monmouth's pseudohistorical chronicleHistoria Regum Britanniae. According to Geoffrey, Hafren is the eponym of the Severn, which bears one of Britain's most ancient river names (recorded as early as the 2nd century in the Latinized form Sabrina).